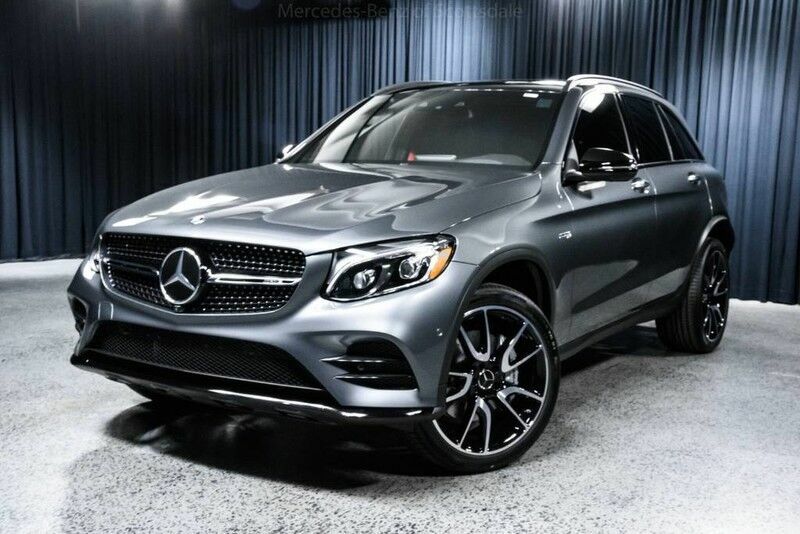 This 2019 Mercedes-Benz AMG GLC 43 4MATIC is offered to you for sale by Mercedes-Benz of Scottsdale. This Mercedes-Benz includes: PARKING ASSISTANCE PACKAGE Automatic Parking Hands-Free Liftgate Back-Up Camera Remote Trunk Release DRIVER ASSISTANCE PACKAGE Lane Departure Warning Lane Keeping Assist Brake Assist Adaptive Cruise Control Blind Spot Monitor Cross-Traffic Alert HEAD-UP DISPLAY W/AMG-SPECIFIC CONTENT Heads-Up Display EXTERIOR LIGHTING PACKAGE MULTIMEDIA PACKAGE Navigation System CD Player Auxiliary Audio Input Hard Disk Drive Media Storage Entertainment System MP3 Player PANORAMA ROOF Panoramic Roof Generic Sun/Moonroof Sun/Moonroof Dual Moonroof AMG NIGHT PACKAGE *Note - For third party subscriptions or services, please contact the dealer for more information. * Want more room? Want more style? This Mercedes-Benz GLC is the vehicle for you. You deserve a vehicle designed for higher expectations. This Mercedes-Benz GLC delivers with a luxurious, well-appointed interior and world-class engineering. This Mercedes-Benz GLC is equipped with AWD for improved handling. Whether you're faced with inclement weather or just out enjoying the twisting back road, you'll have the grip of AWD on your side. What's the best way to keep your occupants occupied in this Mercedes-Benz GLC? A full-featured entertainment system. It's included and ready to entertain. Where do you need to go today? Just punch it into the Mercedes-Benz GLC on-board navigation system and hit the road. This outstanding example of a 2019 Mercedes-Benz GLC AMG GLC 43 is offered by Mercedes-Benz of Scottsdale. Want more room? Want more style? This Mercedes-Benz GLC is the vehicle for you. Pull up in the vehicle and the valet will want to parked on the front row. This Mercedes-Benz GLC is the vehicle others dream to own. Don't miss your chance to make it your new ride. Once you see this Mercedes-Benz, you'll quickly see that this is the perfect vehicle for the outdoor junky! You'll even feel relaxed knowing that this All-Wheel drive vehicle will get you to where you are going no matter what may come your way. Also, with this Mercedes-Benz GLC's dependable control you'll be able to drive into the sunset without a care in the world! Based on the superb condition of this vehicle, along with the options and color, this Mercedes-Benz GLC AMG GLC 43 is sure to sell fast.